Sep 27, 2015 (LBO) – Sri Lanka’s maritime industry can boost and support the islands efforts in international trade and investments to enable further long-term growth, a senior official said. “Sri Lanka has to be a hub for more than South Asia to realize the full potential of our valuable ports and shipping,” Mohan Pandithage, Chairman, Hayleys said. He was speaking at the inauguration of the Colombo International Maritime Conference 2015 in Colombo recently. Pandithage says, we need to designate Colombo and Hambantota ports as free ports and Katunayake, Koggala and the other export processing zones as free trade zones. He says, businesses involved in entrepot trade will benefit from the free zones comprising imports, value processing, value addition for re-exports and off shore businesses. At present the free ports closed to the Indian sub continent are in Singapore and Dubai which cater to the ASEAN and Middle-East regions. This leaves Sri Lanka, he says, a unique opportunity to serve the power houses in our region India and China. We must collectively try to rebrand our industry as a career choice and work towards a work choice, he added. According to latest Central Bank data Sri Lanka’s Colombo port has continued to meet the challenges in the maritime sector successfully with two new main shipping lines starting using the Port this year. During the first six month of this year the number of vessels calling at the port has increased by 12.7 percent and the cargo tonnage has increased by 2.8 percent. 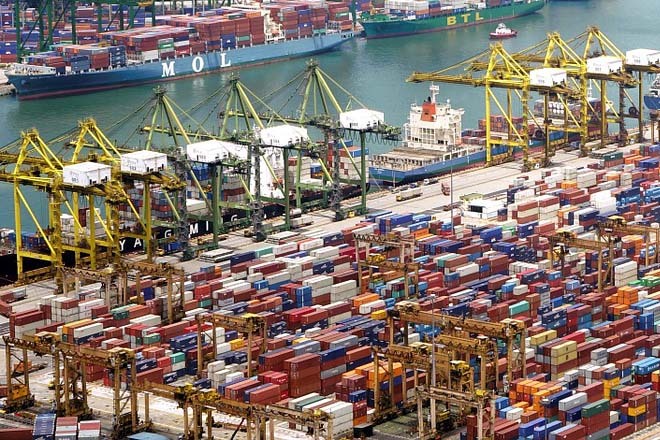 Container handling has also increased by 6.4 percent. The conducive initiatives taken by the Government and the Sri Lanka Ports Authority (SLPA) in the maritime industry also enables ship building, ship repairing, ship bunkering and many other related activities. Analysts say as the rapidity of public-private partnerships and outsourcing gathers momentum, the logistics industry is likely to benefit from continuous growth.